Note: Google Webmaster Tools is now called Google Search Console – Click here to view our new guide! If you aren’t using Google Webmaster Tools, then you’re missing out on a valuable and (more importantly) free tool that offers a lot of features that can help you improve your site for search engines as well as visitors. Here are just a few areas you can improve using Google Webmaster Tools. Not Set Up on Google Webmaster Tools Yet? If you’re ready to use Google Webmaster Tools with your website but haven’t set it up yet, it’s easy! Just follow these steps. Log in to or create your Google Account. Go to Webmaster Tools and click the red Add a Site button. Enter your website’s URL and click Continue. Verify your website using one of four methods including uploading a small file to your webserver, adding a HTML tag to your website’s homepage, sign in with your domain name provider, or have Webmaster Tools check your Google Analytics code. Your website should now be set up with Google Webmaster Tools so that you can do the following. Note that, after sitemap submission, you will probably need to wait a week or so for Google to collect data about your website. If you have just created a website and want to boost its chances of getting indexed quickly, start by submitting a sitemap for your website. A sitemap is an XML file that tells search engines what pages you have on your website and how often they are likely to be updated. If you use WordPress, you can install a free plugin like Google XML Sitemaps and have the plugin automatically create one for you. Otherwise, you can use generators like XML-Sitemaps.com to create the file for you and then upload it to your server. Once your sitemap is created, you should have a link that looks like http://yourdomain.com/sitemap.xml. 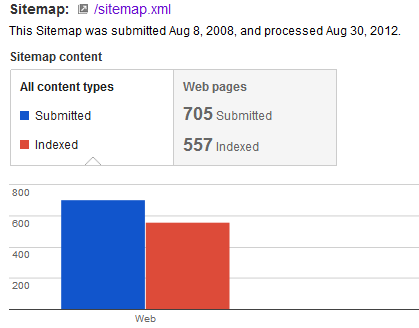 Go to your website’s profile in Webmaster Tools and under the Optimization menu, click Sitemaps. Then click on the red Add / Test Sitemap button and enter the file name of your sitemap in the box. After a few days, you should start receiving stats about the number of URLs submitted through the sitemap and the number of URLs that are indexed on Google. Keeping an eye on your sitemap can alert you to problems. For example, if you see a sudden drop in the number of URLs that are indexed, this could mean that pages on your site are having problems or that you are potentially being penalized by Google. Typically there will be an alert / warning that will explain discrepancies beneath the graph. One thing that can hurt user experience on your website is when visitors attempt to visit a page on your website (or linked out from your website) and receive a 404 page not found error. 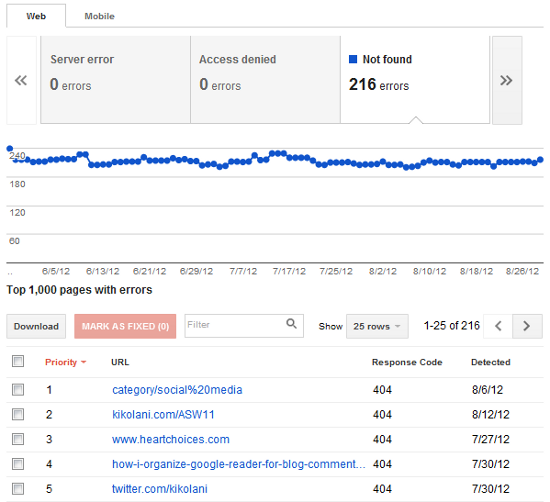 When it happens, Google Webmaster Tools makes a note of it. To see your 404 not found and other errors, look under the Health menu and click on Crawl errors. Here, you will see a graph and report of top errors on your website. Click on Not found to see your 404 errors. Forgetting to create or redirect pages after a website redesign. External websites changing domains without redirection. Your website or external websites being down at the time a visitor clicks on the link. You can’t prevent every 404 error, especially ones on other sites. But you can go check them out and fix some of them to prevent your visitors from stumbling upon missing pages and broken links. Not sure if your website is appropriately optimized for search engines? Look under the Optimization menu and click on HTML Improvements. Here, you will receive a report of various on-site optimization issues Webmaster Tools has noticed on your website. You can click on each linked item to learn what the issue is, how to resolve it, and pages on your website that the issue has been recorded upon. The big ones to start with are the title tag issues since title tags are one of the strongest elements on your pages to help with rankings of your website in search. Then move on to meta descriptions and other errors. While Google Analytics tools can tell you what keywords have brought visitors to your website, Webmaster Tools can tell you what keywords lead to impressions of your website in search, where you are positioned in search for those keywords, and how often those impressions lead to clicks. Look under the Traffic menu and click on Search Queries to find this information. To see the content associated with a particular keyword, click on the keyword itself. You will then see the page or pages on your website that appear in search for the keyword and how each page does in terms of impressions, clicks, and CTR. This can help you in two ways. 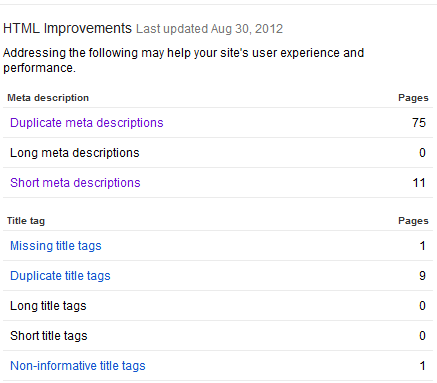 You can visit each page to see if the title and meta description can be improved to encourage more clicks from search. You can create more content around that keyword in order to get more impressions and, hopefully, higher CTR with fresher content. 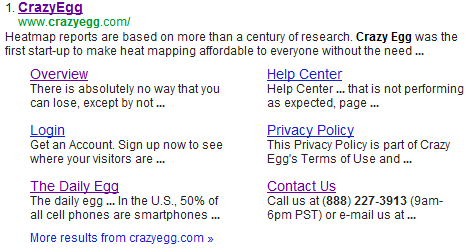 Since April 2012, Google has been updating its algorithm to seek out websites with an unnatural linking profile. Websites determined by Google to have unnatural links (red flags include over-optimized anchor text, paid links, spammy links, etc.) will either be sent a warning via Webmaster Tools or will be told that they have been penalized because of them. The sad part is that any business that has ever paid for bad links through a service or built bad links themselves could be subject to this penalty no matter how long ago the links were created. If you do happen to receive the warning or penalty, Webmaster Tools is a good place to find your bad links. Just look under the Traffic menu and click on Links to Your Site. Then click the more link under Who links the most. Here, you will be able to see domains linking to your website, how many links they have to your website, and how many pages they are linked to. For example, seeing 1,000s of links to one linked page on your website can indicate a site that has linked to you sitewide in their blogroll or footer. Too many sitewide or footer links is just another red flag for unnatural links. 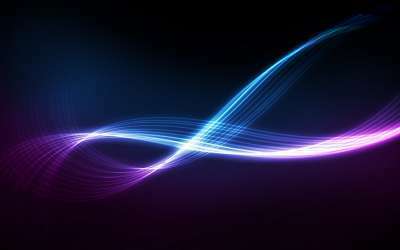 If you visit the site and see that it is not relevant to yours, you will want to ask the webmaster to remove the link. While it’s a tough job, it’s what Google wants to see- you requesting that all of your bad links be taken down – before they will lift the penalty on your website if one is applied. 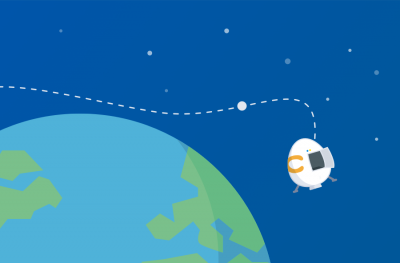 You can learn more about Penguin, ways to recover from a penalty, and safe ways to build links here – 79 Link Building Resources for 2012. 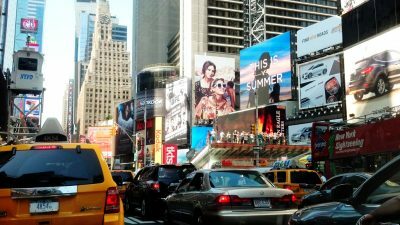 Do a Google search for your brand or website name without the http:// or .com. Assuming your website comes up in the number one spot, you might see several links underneath your website. 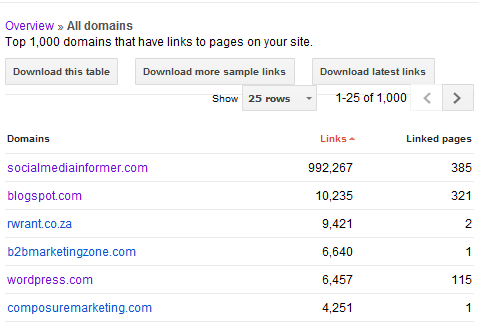 These are your sitelinks. 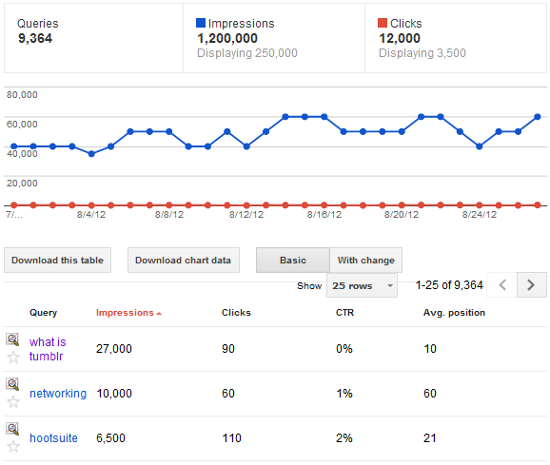 There you have it: some great ways to improve your website through Google Webmaster Tools. Do you use them? What other information have you gained that helped you improve your website?